After huddling up in the coach at 8 am on 7th of December, the Weidenfeld Hoffmann Trust scholars (missing our friends from the Masters of Public Policy) departed from Oxford to their destination – Cumberland Lodge in Windsor Great Park. The 17th century country house, widely known for its special architectural and historic significance, is truly spectacular but without any display of ostentation. Today Cumberland Lodge, with the Queen as its Patron, is an educational charity initiating fresh debate on the burning questions facing our society. Thus the spot was a propitious setting for an exacting academic workshop and residential training. It was a beautiful day and Alexandra Henderson, Director of WHT kicked-off the practical skills workshop by giving a succinct introduction to the program and its intended objectives. She is undoubtedly a smooth operator with sublime event execution skills. The first session was on ‘Examination and Essay Writing Skills,’ led by John Adamson, our Academic Director. He made an incisive presentation of how to frame our answers in response to the essay questions in the examination. Examinations are always a dreaded topic for many students. After briefly summarising the examiners’ psychology, John delineated the specifics of a perfect essay response for our examination questions. He has a remarkable ability to make this quotidian concept seem clear. Far from being dry, the presentation assuaged the curiosities of many scholars who have an enervating task ahead immediately after Hillary Term. Later in the noon, four Blavatnik Fellows from the University of Cambridge joined us and we exchanged our reflections on Michaelmas Term. The next session was on ‘CVs and Job Applications’ by Jonathan Black, Director of the Oxford University Career Service & Internship Office. The session was quite useful, as it emphasised how to write a winning covering letter and structure our CV. It was followed by a mini-balloon debate led by Pamela Dow, Director of Strategy at the Ministry of Justice and the WHT Scholarships Advisory Board Member. The three nominated speakers put up their cases that they viewed were important in today’s context. Mahin Iqbal was voted as the winner of mini-debate for passionately arguing her case that time was running out to deal with the impending environmental disaster. It touched a chord with majority of scholars that humankind could be at the receiving end if the problem of environmental damage is not given due consideration. Two other scholars, Ilan Manor and Abhishek Raman Parajuli, also made trenchant argument for their cases. It was indeed a long day after the mini-debate session, but that did not prevent the scholars from engaging in deep and meaningful discussions later in the evening. We held discussions on wide-ranging issues, from growing prejudice and bigotry in the world to ethical considerations in scientific advancements, many times disagreeing with each other’s views. But we learnt how to embrace the diversity of ideas. Day two of our workshop had a major thrust on accentuating our Interview Skills. The introductory session was led by Dan Leatherdale, Tom Stuttaford and Christianne Davies of AGL communications. We started with interview skills group work, with both coaching and on-camera work in the Clark Room and Library. It was quite intimidating but very useful to see how conscious one can become when facing the camera. Watching the recordings of our interviews was nothing short of an epiphany. The rendition was repeated after the individual feedback session and we were amazed to see the improvement. These discussion sessions helped us on how to be comfortable in front of camera and make the most impact. The scholars realised how valuable it is to coordinate CV writing and interview skills. After one-to-one mentoring sessions and a discussion in the Forum Theatre, this exciting session was concluded by AGL. After this steep learning curve with interview skills, we were led to meet some accomplished leaders from across sectors. WHT scholars split into two groups. One group interacted with Rafat Al-Akhali, Louis Dreyfus-Weidenfeld Alumnus (MPP 2013). He has been active in the field of youth development since 2004 and in November 2014 he was sworn into the Yemeni cabinet as the Minister of Youth and Sports, the youngest minister in the history of Republic of Yemen. He shared his story of how he left his successful IT career in Canada to go back home to Yemen to contribute to the building of the nation. Simultaneously, a session was held with Alex Duncan, the Director of Policy Practice, with the other group of WHT scholars. Alex has a background in agriculture and rural development, but most of his current work is on the political economy of development. He shared his experience on how his team uses multi-disciplinary approach in undertaking policy work and capacity building in developing countries, mainly Africa. Day three began with a task of arranging the Weidenfeld debate that is to be held on 4th March 2016 at the University of Oxford, organized by the scholars. During our discussion, the scholars concurred to continue the Weidenfeld Debate event based on ‘Intelligence Squared’ debate format with two speakers debating for and two against the motion. An organizing committee of volunteers was set up comprising of Thai Dang, Athi Esther Nkopo, Ilan Manor, Aban Haq, Birendra Rana and Payaswini Tailor. The last session of the day and the workshop was with Edward Smith from The Times who led the topic on ‘Op-Ed writing skills’. He talked about his transition from a professional cricketer to an op-ed writer. He said that his trenchant desire to produce some creative writing got him into this sector, even though he was a prolific writer from his university days. The session proved to be quite useful to the scholars as it entailed how to structure your op-ed articles and how to attract the attention of the editors. Sadly enough the workshop was closing in, but the best part of the workshop was still saved for the end – a visit to the majestic Windsor Castle. Everybody in the group was excited to get to the castle. Once inside, the scholars were besotted by the beauty and magnificence of this grand estate that holds a central place in British architecture. It was easy to extrapolate the predilection of The Royal Family for the finest things from the invaluable collection of artifacts in the palace. Everybody was rejoicing in the awesome environment but as the clock ticked 4 pm, it was a poignant reminder that our blissful oblivion at Windsor palace has concluded here. After snapping a few group pictures, we bid farewell to the scholars from Cambridge. 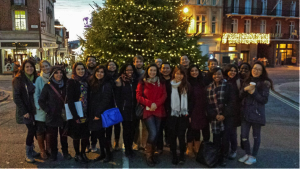 At the denouement of the ‘practical skills workshop’, the WHT scholars headed back to Oxford filled with earnest desire and increased confidence to deal with present days challenges in the world.